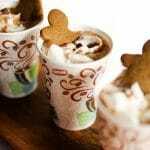 This Pumpkin Gingerbread Hot Cocoa is a rich and decadent drink to enjoy the holidays, without tons of added fat and sugar. Combine all ingredients over medium heat in a large saucepan. Bring to a low simmer, whisking often, until everything is smooth and dissolved. Serve hot, optionally topped with whipped cream and gingerbread cookies. Recipe from Live Eat Learn at https://www.liveeatlearn.com/pumpkin-gingerbread-hot-cocoa/.